​In this article, we short-list the top ankle braces currently available in the market. Our aim is to provide you with the essential information needed for you to decide which is the the best ankle brace for your recovery or sport. An ankle brace is a flexible fabric that you put over your ankle to either protect yourself from injury or support an already injured ankle. Ankle support braces are typically laced up like a shoe or pulled on to the ankle like a sock. Whichever the case, the main aim is to protect your ankle during weight or movement intensive activities or sports. If you already have a sprained or injured ankle, the brace provides much-needed support to maintain the ankle in a position that encourages healing while preventing further injury. Finding the best ankle support brace has a lot to do with what you want to get from it. There is a huge distinction between braces that help with an already injured ankle and to those that prevent injury in the first place. Here, we cover the best products on the market and offer useful insight into what your best option might be. Why Choose an Ankle Brace over Athletic Tape? The Kunto Fitness Ankle Brace package arrives as one support sleeve which is okay because you rarely have two bad ankles. This product may be a great option for someone suffering from an ankle injury, it provides even pressure throughout the ankle and relieves pain caused by swelling, sprains, arthritis and other conditions. We liked that the fabric is breathable and flexible which is useful for strenuous activity such as CrossFit and running. It’s also in store in a variety of sizes including extra small for kids, small, medium and large. One of our biggest frustration with some of the ankle supports we tried is the fabric sliding down the leg like an oversize sock. We were able to find a perfect fit which held snugly even while hiking for long hours. The fabric is comfortable and doesn’t get in the way of your physical activity. If you are concerned about itchiness or feeling constricted, this might be a right choice. You soon forget you even have it on after the first few minutes. It’s easy to put on as well. Simply pull it over your ankle like a sock, no laces or anything of that kind. The Amazon reviews are overwhelmingly positive which reinforces our opinion that this might be the best ankle support brace out there. Several users with severe pain from injury or surgery report gaining much-needed support and relief from this product. One user complains that his support brace stretched out after about four months of use. The ASO Ankle Stabilizer is a proper ankle brace and comes as a bilateral brace; meaning you can use it on either foot. Its figure-eight design and straps offer great ankle support while its ballistic nylon construction lends it durability and stability. This product is a professional-grade ankle support brace and may be one of the best options for an athlete or someone who is seriously into sports and fitness. The ankle brace is thin, so it fits comfortably in your shoe but without sacrificing ankle support. We liked that a lot of detail went into the design of this product, which is always encouraging for an athlete’s product. Simple factors such as the lace position make all the difference. The lace, in this case, is centered and tethered to the tongue to ensure that the brace stays exactly in place even during vigorous activity or movement. This ankle brace is an excellent choice as a preventive and injury management product. Athletes and orthopedic doctors alike recommend this product. The Amazon reviews are better than encouraging. One user with a severely broken foot uses this brace regularly (after healing of course). This ﻿﻿﻿﻿﻿brace﻿﻿﻿﻿﻿ is an evolutionary step forward in ankle protection. It's known for its heal-lock technology that provides a more conforming fit for the ankle. As you can see when you pull the straps on the side of the brace, it will securely grab hold of the heel locking it in place to provide stability for the ankle. It also has figure eight nylon straps that replicate ankle taping so your ankle and foot feel securely held together within the brace. 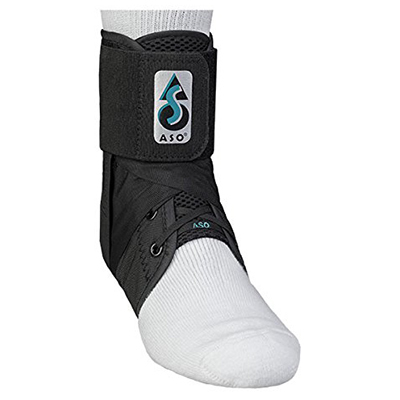 With a dynamic cuff at the top to support and stabilize the ankle, the ASO is an excellent choice to protect against high ankle sprains. This brace is not foot specific and is designed to fit over an athletic sock. First, you will loosen the laces all the way to the toe. You will then slip the brace on until the heel is in place. Starting at the bottom, you will lace it up as tight as possible. You will then bring the inside stabilizing strap over the top of the foot and wrap it under the arch and connect the strap to the side of the boot. You will then repeat with the outside strap. Once you have both straps attached properly, place your foot flat on the floor so that your leg and foot form a 90 degree angle. You will then grab hold of the finger loops on both straps and pull them upward as tight as you can and re-attach the straps to the velcro. The straps should be as tight as possible for maximum support. Doing this allows the heel-lock technology to secure the heel in place giving your ankle great protection. You will then wrap the elastic cuff over the tight laces so that the ASO logo is facing forward. We think the Sleeve Stars Foot Sleeve with Ankle Brace Strap offers the best value for money next to the Kunto Fitness brace. 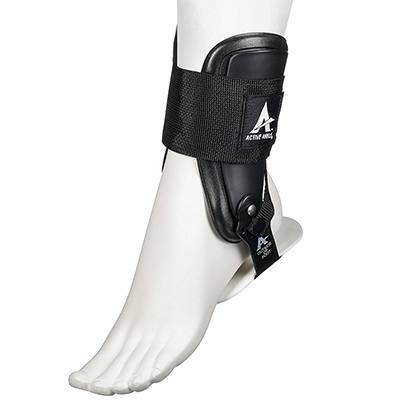 Again, this is a proper ankle brace complete with a strap to keep the ankle nice and tight. 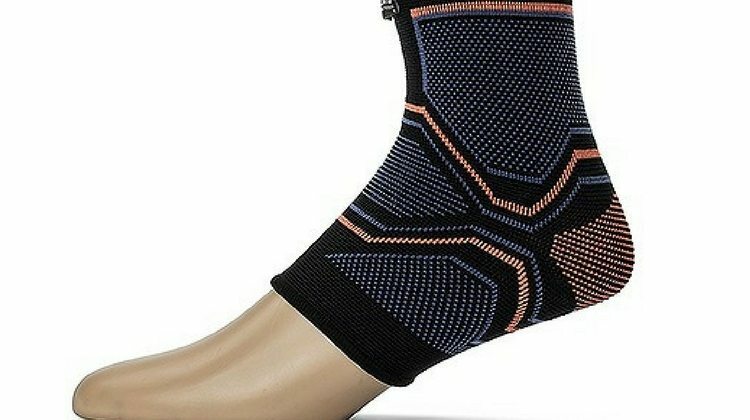 This product is also very versatile; you can wear it to support an injured ankle, when out for a run and need a little support and even in your sleep. It is that comfortable. The slim design also allows you to wear it with your running shoes and is just as comfortable with slippers. Finally, it's nice to see an ankle brace that is machine washable and which absorbs sweat as efficiently as this one does. We tried it out for a run, and the feet were dry and odor free. The reviews on Amazon for the ankle brace are mostly positive and encouraging. One user suffers from plantar fasciitis and highly recommends this Sleeves Stars product. It has helped him a great deal with pain management and keeping his ankle stable while walking. One reviewer sent his product back because it got loose after a few hours of walking. Introducing the new, high quality ankle brace by Sleeve Stars. The number one best recommended, comfortable, and relaxing foot sleeve. Do you suffer from plantar fasciitis, heel spurs, foot swelling, ankle injuries, arthritis, stiff or sore muscles and joints? 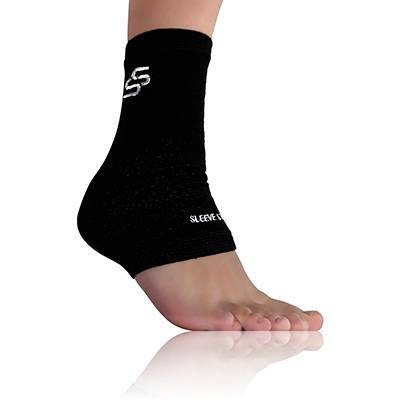 This foot sleeve is the ultimate solution for stiff, weak, sprained, or injured ankles. If you want to recover faster, and minimize pain, discomfort or swelling, then this Sleeve Stars foot compression is the best product for you. Why should you choose Sleeve Stars foot support? It offers superb ankles support while also accelerating recovery and reducing muscle, joint, and tendon inflammation, pain or soreness. Why try to heal a sprained ankle when you can avoid it in the first place? Our sleeve prevents injuries and elevates your performance - staying at the top of your game no matter what. Reach maximum performance at everything you do with sports sleeves - running, weightlifting, volleyball, basketball, football and every other form of exercise. 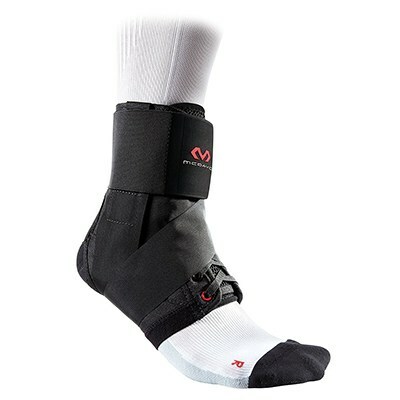 This Ankle Active T2 Brace is designed for athletes and active people in mind and is minimalist from appearance alone. It features a single strap so putting it on requires zero effort. We tried it for soccer and basketball and highly recommend it for ankle support and protection during sport. We like the light material and flexible padding which fits nicely to the contours of your foot. It’s very comfortable and has an adjustable strap that you can change when wearing high-top or low-top shoes. This product might be another great option if you are suffering from a strained or sprained ankle. Keeping the trend with the other ankle braces, we have reviewed here; The Active Ankle T2 Brace has almost all positive reviews on Amazon. One reviewer with a long-term ankle injury loves the freedom and flexibility that this product offers him. One lady, however, complained that her brace fell apart after two months of use. This professional model features a feather-light EVA padding system along with a performance hinge to allow an almost unlimited movement for the ankle. The EVA padding allows the brace to conform to the ankle for a comfortable, individualized fit while also wicking away moisture. Its U-shaped design relieves pressure from the ankle joint and the T2 has one quick-fit strap that adjusts for both high and low-top shoes. This brace is not foot-specific but the Active Ankle logo goes on the outside of whichever foot you put it on. For maximum comfort, it is recommended to place the brace underneath the insert of your volleyball shoe, in which case you will remove the white heel pad from the brace. If the insert of your shoe does not come out, or you choose not to put it inside your shoe, you can still use the brace but you will need to leave the heel pad on and put the brace on separately from the shoe. Once the brace is securely put in place underneath the insert of your volleyball shoe, you will slip your foot into the shoe. You will then grab the small posterior Velcro strap located on the outside of your ankle right below the hinge and you will pull it across the back of your leg at an upward angle and fasten it to the Velcro on the other side of the brace. This strap does not need to have a lot of tension – it’s simply there to creating more custom fit for the brace. After securing the posterior strap, you will then take the large Velcro strap at the top of the brace and wrap it around your leg until it is securely Velcro tight for maximum ankle protection. We think the McDavid 195 Ankle Brace with Stabilizer Straps is the best ankle support brace for a professional athlete. It is made from sturdy polyester in a single layer for a lightweight support brace that offers exceptional ankle support. You might like this one if you are a professional or enthusiastic athlete taking pre-emptive measures to protect the ankle from injury. 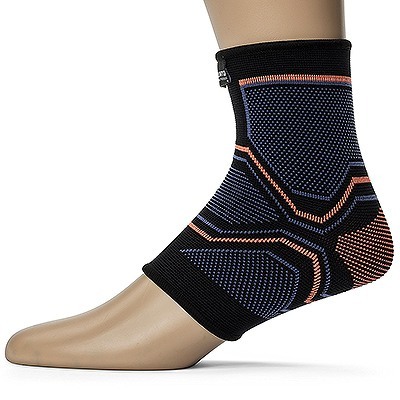 This ankle brace uses a figure-6 design and mimics athletic tape, so this might also be a useful option to explore if you are looking for a professional-grade product for home use. The lining is well padded for comfort while the breathable material and design keep your foot from getting too hot and sweaty during physical activity. It also works on either foot. We saw all positive reviews on Amazon. One reviewer is a school custodian and has to walk through rough terrain for long hours. He finds this product very useful. Another reviewer initially had trouble finding the correct size but loved the product once she did. Start by loosening the straps of the ankle brace. Put your foot into the brace and pull it all the way back so that it fits snug against the heel. Make sure the heel is peeking out at the back of the brace and that you can feel the natural arch form underneath your foot. Once your foot fits in securely, tighten up the laces similar to the way you tighten up a shoe and then pull the laces as tight as possible and lace it all the way up. Take the figure six strap and start on one side and go over the foot ﻿﻿﻿then﻿﻿﻿ under the foot and secure it up on the ﻿﻿﻿﻿﻿Velcro﻿﻿﻿﻿﻿ on the opposite side. Repeat this step for the other foot. Take the horizontal strap which gives the 195 a little more support up the top, and it’s going to hold it in place as it is tightened and finally locked into place with the Velcro. This now gives a full support for the ankle through the lacing, through the straps, and the final top elastic strap around the top. It is not right for us to downplay the importance of athletic tape but it is necessary to look at both the tape and brace from an objective point of view. This approach should help reach a clear and fair conclusion. Although athletic tape is very useful for preventing and managing ankle injury, there are far too many factors to make this a useable option for the average person. A professional such as a physical therapist, doctor or athlete trainer typically applies the tape. This requirement is necessary because for the tape to be useful, the application should correspond to the particular injury. The tape also loses its elasticity and support through sweat and wear, making this a temporary option that needs to be re-done often. The ankle brace, on the other hand, doesn’t require any special skill or knowledge to put on and fasten. Some of the advanced products may have a learning curve, but they are still far more practical than athlete tape. An ankle brace is also reusable and therefore cheaper in the long-term and is much quicker to put on. Whether it be for running, basketball, volleyball, or soccer, ankle braces can provide the support you need. There are three distinct types of ankle support braces. These braces are soft, rigid and lace-up. Soft Ankle Braces: are useful for preventive ankle care. They prevent rolling and side movement and provide moderate support. This type is not recommended for an existing sports injury although it is a good choice if you occasionally play games. Rigid Ankle Braces: are also useful for preventing ankle injury and perform better than the soft kind. They also prevent excessive side movement while allowing up and down movement. This brace is right for supporting an existing injury and for professional athletes or physically active people. Lace Up Ankle Brace: is designed for the professional athlete in mind and uses the best in ankle brace technology. This brace offers maximum tightness control and flexibility. You can choose the tightness at different points of the foot. You are more likely to see one on a professional basketballer than your neighbor out for a jog. Finally, we have a few recommendations for you to follow to guarantee that you find the right brace. An ankle brace is virtually useless if it doesn’t fit right. Although easier, we do not recommend that you buy a general size. Check your shoe size and cross-reference with a brace chart where one is available. The braces we recommend here are either sold in a range of sizes or are fully adjustable to accommodate just about any foot shape and size. You should have clear expectations of your ankle brace. For example, a brace for supporting a sprained foot is not the same as one for preventing a sports injury. In this example, a post-injury brace is an ideal choice for treating an injured ankle. An elastic sleeve is an excellent choice for preventing injury during light activity such as walking or jogging. Ankle braces range from the very basic to complex products for a professional athlete. A lace-up brace, for example, is an excellent choice for the average sports enthusiast. An athlete, on the other hand, requires a rigid stirrup brace that offers maximum support and robust strap adjustment. Some ankle braces simply slip on while others are adjusted, and laces tightened. The latter type is frustrating if you have never used an ankle brace before but comes with instructions. If you require necessary ankle support to prevent injury, the slip-on version is an ideal choice. It offers the best value when we compare it to all the other options on the list. This brace provides the best ankle support at the lowest price. It is a basic support brace with surprising functionality. The product works just as well for providing support for a sprained ankle and preventing injury in the first place. This product is also incredibly easy to wear and has no learning curve. There are no laces or adjustments, only take it out of the box and put it on. The size variety is impressive, and you are sure to get one that fits you perfectly. If you are a professional athlete, we recommend you look elsewhere such as the Active Ankle T2 Brace. As for us regular Joes, the Kunto Fitness wins hands down.